Do you dream in color? We do. Stainless Steel, Brass, Copper, and Bronze colors to be exact. And how about those amazing Turquoise color eyes? 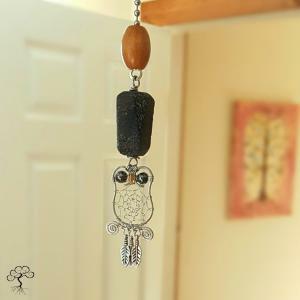 Attract good luck to your home and diffuse your favorite scent all at the same time with this handcrafted stainless steel dreamcatcher owl light pull. The whimsy of woodland owls and the mystery of dreamcatchers combine using brass, steel, copper, and sterling wire, into breathtaking wearable works of art. MAGNOLIA, TX, UNITED STATES, September 17, 2018 /EINPresswire.com/ — Designer Kay McWhorter from Sonora Kay Creations is pleased to announce the release of her brand-new Autumn Dreams Collection. Each unique item has been individually designed and lovingly handcrafted by Kay. The Autumn Dreams Collection, featuring necklaces, earrings, and home decor, will be available to the public beginning September 21, 2018. VIP Tree Club Members will enjoy exclusive shopping privileges a day early at member-only prices. Sonora Kay Creations is known for creating amazing nature inspired jewelry and home décor, bringing delight to all who acquire her limited editions. For the first time, Kay McWhorter has created an entire product line reaching back to her beginnings in making jewelry, when she would spin webs at a local outdoor venue in front of an admiring crowd, and combined it with must-have trends for Autumn 2018. 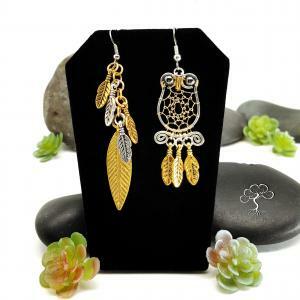 The Jewelry and Home Decor items in the Autumn Dreams Collection are designed to showcase dream catchers, which are widely believed to allow only good dreams through, and owls, symbols of good luck. Nature lovers everywhere will feel they are attracting the luck they desire when wearing one of these beautiful pieces. The Autumn Dreams Collection is available for a limited time exclusively on SonoraKay.com beginning September 21, 2018, and is expected to sell out well before the end of the season. Prices range from $45 to $150. Kay McWhorter said she is excited to present this collection to her fans and followers, and especially her VIP Tree Club members who played a role in the design process. Kay McWhorter started designing and selling her Jewelry and Home Decor after she was faced with the need to create income, and at the same time be a full-time caregiver to her spouse who suffered a stroke shortly after they wed in 2007. She started working from home while still in college studying business management, and after graduating at the top of her class in 2012, continued to work from home where she has built a successful e-commerce business.